Venue: Twickenham, London. Date: Saturday, 26 September. Kick-off: 20:00 BST. Coverage: Live on BBC Radio 5 live, BBC Radio Wales & BBC Radio Cymru, plus live text commentary on the BBC Sport website and app. It is the biggest match of the Rugby World Cup so far: two ancient enemies, two neighbours united by both border and historic rivalry, coming together in a group in which only the strongest can survive. What will it mean to the two nations - to those lucky enough to have tickets, to the parents of the players, for youngsters being allowed to stay up late and to those of more grizzled vintage watching in boozy clubhouses? Neither side will want to slip up - knowing only two qualify from Pool A which also includes Australia. There are two facets to watching George as a parent: there's me, high on adrenaline, and there's his mother Jan, high on fear. The pure adrenaline kicks in for me at 6am. I don't need a drink. It still feels amazing to me, even now he's 23 and with 51 caps. The joy is still fresh. Every game he runs out you can't believe it's happening. I remember going to Twickenham with George when he was nine to watch the Heineken Cup final. During the match he decided he wanted to learn to whistle properly, with two fingers in his mouth, so he could get involved. To my great regret I taught him. It was all I heard all the way back home to Anglesey. Going to Twickenham can feel like going to the Stade de France. It's out of town, a train or metro ride away. It can be sterile, whereas the Millennium Stadium - well, the memory of that night in 2013 when we took England's championship and Six Nations title is electric. And after the Grand Slam win in 2012, we walked back from the players' hotel at 5am and it was still going strong on the streets of Cardiff. Saturday night is all about expectation for me. For Wales, this is our cup final. If we get this right, it's onwards and upwards. I saw George and the boys last weekend, and all the talk was about this match. They have it in them to win this week but whatever happens, we'll all walk away from it. It's not like football - somebody will be upset, but we'll all get on afterwards. With our proximity to the border, in the old days when Wales was a dry country on Sundays we used to get busloads of them turning up in Lydney. They would run off with our women and then we would run after them and a few fights would ensue. But that's all changed now. The local banter has always been there. Before the inception of leagues we used to play Welsh clubs on Wednesday nights, and it was always hard but fair. The hospitality was fantastic. We'll have 150 people down on Saturday night, with the big screen up in the clubhouse. Beer and cider and lager, pasties and chips. Like most clubs we'll have a happy hour early in the evening and then maybe another at 10pm, depending on what's happened at Twickenham. It'll be a hell of an atmosphere. 8pm and alcohol are not the ideal partners, but the one certainty with rugby crowds is that it doesn't lead to anything silly. There'll be Welshmen there on Saturday night. There's always Welshmen there. At least, they're Welsh when they're winning. It's going to be huge. Had I been doing the road race at the World Championships this weekend, I would have been watching the match on my laptop in a hotel room in Virginia. I'd investigated streaming options, and it was definitely possible - French cyclist Tony Gallopin tweeted a photo of him watching France v Italy in the same scenario - but it might have lacked a little atmosphere. Instead, with my season having ended after the Vuelta because of exhaustion, I've pulled off a rather decent silver lining: a ticket for Twickenham. And because my season has been over for more than a week now, my drinking form has come back a treat. By Saturday it'll be at its peak. Great timing. I've never been to Twickenham before. During the Six Nations I'm away in Belgium and northern France, racing the Spring Classics, so all my trips to the Millennium Stadium are during the autumn internationals. It's going to be immense. As a kid growing up in Cardiff, England are always the rivals you pretend to be beating - when you're on your bike, when you're playing in the year eight rugby team at school. But it's a good rivalry: fun, not bitter, added spice rather than actual hatred. It may well be too nerve-wracking to fully enjoy. When my fiance Sara watches me race it's the same thing: the only bit she can enjoy are the last few seconds when she knows I'm OK. I'm staying down for the night so I'll have to get my tactics right; it might help to numb the pain if you get blind drunk, but it would be sad if you couldn't remember a historic triumph. Perhaps the way to do it is to pace things to half-time and then, if it's all going south, get on the gins. What achievement would I give up for a Wales win? Not a top 10 in the Tour de France. I'd take the top 10 and an England win on Saturday, but only if we can then meet again in the final and beat them. Beating England, at Twickenham, in a World Cup final? Nothing would be better. My first match at Twickenham, aged 10, was the Erica Roe one in 1982. My dad got permission from my mum to take me and my big brother; there we were, virtually on the front row, and Erica streaked across the pitch. You tend to be quite fond of rugby when you've seen that as a 10-year-old boy. This time I'm setting off from Essex at 10am. There are lots of us going up from Burnham Rugby Club, so we'll have a steak lunch in Richmond, watch the Springboks v Samoa match in a bar and then hook up with the rest of the Burnham lads. This game is huge. Apart from the Aussies, no-one hates us more than Wales. They don't care about anything else than beating England, and that passion is unmatched - especially against England. When you see the Welsh team singing their national anthem, you can guarantee that 30% of them will be crying. I've never seen an English player cry. That's our greatest fear - that they will want to beat us like no-one else. Equally, man for man, they don't have what they had. Injuries have hurt them. We should be too strong. I don't have a great record against Wales - I was at Twickenham in 2012 when they beat us - but my levels of optimism going into this one are pretty high. It is a must-win game, because we do not want to be going into the Australia game on Saturday week having to get a win. Let's beat Wales, and then treat the Wallabies as the bonus. This match feels even bigger than the Six Nations decider in Cardiff in 2013. Any England v Wales contest captures the nation's imagination in Wales, because it is little brother against big brother, and in the big brother's back yard, but you get the sense outside the country that this is as high profile as it's ever been anywhere else too. It's bigger than the World Cup quarter-final I played in back in 2003. It's in England, rather than Brisbane; it's on a Saturday night, at prime time; there's been almost a two-year build-up since the draw was made. Everyone's diary for Saturday has shut down for months. And there are huge implications for both teams if they lose. The sense of anti-climax for the defeated side will be devastating. In 2003 there was no expectation on us. We were a young team in transformation, with lots of old stalwarts retiring and youngsters taking their place. 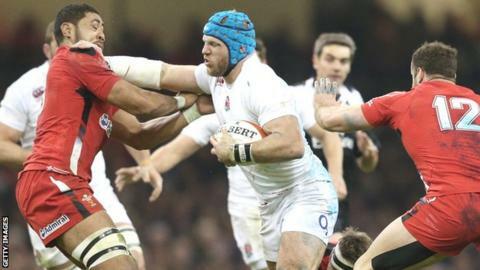 This time there is expectation on both sides now - Wales because they reached the semi-finals four years ago, England because it is their tournament and they are playing at Twickenham. Come Saturday night it'll be one of those 'where were you?' moments. Wales will come to a standstill. There will be special screenings at clubs, whole families coming over to watch it at relatives' houses, kids being allowed to stay up late. I'm actually very jealous of the players. Any ex-pro would be, because these are the sort of games you dream about. It is an absolute privilege to play in a match that matters as much as this one. The Welsh injuries have been devastating, but it does mean we can go into it as underdogs - and Welsh teams are better as underdogs. All the pressure will be on England, and pressure can do funny things to you in sport, both inspire you to unbelievable acts and limit you hugely. The tension will be palpable. This is a once-in-a-lifetime game. You won't get this match in this competition in this country for 20 or 30 years, if at all. That's how big it is. We'll be watching it at school, on the big screen in the main theatre. We did it for the Fiji game but the atmosphere for this one will be much bigger - I'm a day pupil, but I'll be staying on to watch it. We've got a home game against Bryanston in the afternoon. We've also got three Welshmen in the team, one of whom is particularly vocal. Those three will be wearing their Wales shirts in the evening; lots of us will be wearing England shirts. All of us will be singing the anthems. When the three ex-Millfield guys - Robshaw, Mako Vunipola and Jonathan Joseph - were on the pitch last Friday there was a definite extra buzz in the theatre. It makes it all so real for you. Chris Robshaw came to watch our game against RGS Wycombe last year, and he was great - he said hello to everyone. I was also lucky enough to meet Sam Burgess at Bath last season; his enthusiasm was brilliant, and he would talk to anyone. As a player his record speaks for itself. It's a massive match. That defeat in Cardiff a few years ago really hurt a lot of us, and we're desperate to beat them. This is our 142nd season as a club. We were founder members of the Welsh Rugby Union, and it'll be rocking down here on Saturday night. We're laying on enough free curry for 100 people, which is something we do for every Wales game. We're showing every single match in the tournament here. The 8pm kick-off is an interesting one. That's a long old day. You know what rugby fellows are like once they get a taste. All our teams playing that day will come back to the clubhouse. The Firsts are playing away at Forgeside but there's plenty of time to get back. The whole town will be out for it. The ones I feel sorry for are the youth team and their parents - they've got a tournament on Sunday morning that's an hour's drive away. It took 20 years after my first Five Nations match in Cardiff to see an England v Wales match. It wasn't out of choice - whenever England would come to town, so would my godfather from London and various relatives from west Wales. And because a ticket for that match was considered too precious for a child, the adults would always take it. I went to Scotland games, Ireland, France, but never England. That's how big this fixture is. Welsh fans like the negatives more than positives, which may be just as well. We've been the gallant losers for the past five years, losing to almost everyone by a point or two at some stage. And we're definitely not favourites again, although that might free Wales up. If England play decently then Wales are going to struggle. If you took each nation's best XV it would be extremely close, but the next XV England could put out would smash Wales' - and with all our injuries we're significantly into that already. But I'll be travelling full of hope, if also level-headed. I'm planning to meet a couple of the boys for a steak and chips and beers in Teddington at 5pm, then head down to the ground for a couple of beers beforehand. The 8pm kick-off makes it a marathon, not a sprint.